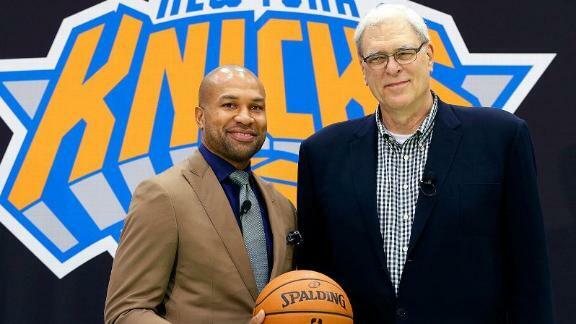 Ever since Steve Kerr was hired by the Golden State Warriors, it seemed obvious to me that Derek Fisher was lined up to be the next coach of the New York Knicks. There was no way that Jeff Van Gundy would decide to leave his comfortable position at ESPN to take over the Knicks as currently constructed. He has previously expressed interest in returning to the bench at some point down the road, but there's too much dysfunction to have to sift through to build a contender. He's in such high demand all over the basketball world I would have found it very hard to believe that he'd settle for such a bad job. The Knicks have two overpaid guys who are causing the team to have cap issues, a superstar who can potentially walk away this summer, a slow point guard with legal issues, Andrea Bargnani, a volatile shooting guard whose behavior on and off the court is totally unpredictable. Of course, what they don't have is their 2014 first round draft pick, because they used it to acquire Carmelo Anthony, which I'm okay with. They also don't have their 2016 first rounder, which they used to acquire...Andrea Bargnani. To put it lightly, I'm not okay with that. That's a lot of front office turmoil that new President Phil Jackson is trying to figure out, but the on court product is certainly a reflection of those issues. The team finished 37-45, finishing ninth in the atrocious Eastern Conference, and missing the playoffs by one game. Despite winning 54 games and finishing second in the conference last year, the team is a complete mess. Van Gundy is too good to return to the team that he quit back in 2001 just to deal with what will be an arduous rebuilding process. The same goes for Mark Jackson, especially after being fired in Golden State due to issues with the management. A bad roster will lead to little success, which would lead to issues with the management in New York. Even worse, when the management is a large public figure such as Phil Jackson, Mark Jackson would have very little power and a very short leash. Jackson will be constantly sticking his nose into things and getting involved, thanks in part to the media forcing that upon him, and also because he's so serious about the game of basketball. Given his coaching experience, the pressure on the coach to perform, and quickly, is simply unreasonable. Jackson could easily find himself a better position if he wanted to leave his job at ESPN. So, I knew that the new man in charge wanted to make a splash, and these three big names, along with Jeff Van Gundy's brother, Stan, were unavailable. And I kept hearing whispers that following the success that Jason Kidd found in Brooklyn, Derek Fisher was looking to transition immediately from being Oklahoma City's point guard to wearing a suit and yelling at people. It just felt like he had to come to the Knicks at that point. And I wasn't so sure how I felt about it. Now that he's here, I still don't know what to think. And really, no one should. As a coach he has absolutely no track record. Even though he's been the floor general for playoff teams in the past, now he has to be the one directly dealing with players' reactions as the rotation changes and different plays are called. Certainly the transition is made easier by the fact that he's been the "veteran leader" for quite a while now, but it's not a slam dunk (no pun intended because, really, Derek Fisher doesn't dunk. Wait a second...take a look at this. So I just learned that not only could he dunk earlier in his career, he has hair. The more you know.) that he can become an amazing coach. The comparison that I keep hearing is Jason Kidd, which I understand. He's the most recent example of the rare immediate switch from playing to coaching. But, I don't really like comparing the two. They simply aren't the same person. I don't intend any deep philosophical meaning with that statement, they literally are different people. Another huge difference is that Jason Kidd took over a much better situation. Despite downplaying the Nets and their ability to go far in the playoffs prior to last season, their roster there was a whole lot better than the Knicks' current roster. And Kidd, despite having to deal with an incompetent general manager in Billy King, didn't have to contend with the giant figure that is Phil Jackson. His path to success was a lot clearer than that of Fisher. So, it's best not to make any assumptions about what effect Fisher will have on the court. But in principle, I love this hiring a lot. The Knicks chose to hire a new guy, not some old, played out retread coach that has failed elsewhere. They're taking a risk as they begin to sort of rebuild instead of hiring Mike Brown or even Mark Jackson or Jeff Van Gundy, guys who have been fired in the past. Fisher has yet to be driven out of a city due to lack of production. Phil Jackson is trying something new, which is always a good thing. There have been too many examples in all sports of coaches getting fired in one place, then continuing to get hired and fail for the rest of their careers. And it's not like Fisher is any random first time head coach. Phil Jackson had an intimate relationship with Fisher, as he coached the former Laker point guard for nine and a half seasons so he knows Fisher well. He's taught Fisher and let him carry out his wishes on the floor as they won five championships together. They're not total strangers to one another. Unlike some others that I've heard recently, I don't think that Jackson is going to be imposing his will on Fisher and forcing him to carry out the triangle offense. He'll let the man coach. Jackson trusts Fisher, and he'll have his guy's back. Overall, I'm very impressed that the Knicks were thinking outside the box and selected a coach that had a different profile than most coaches in the league. I'm very excited to see how that translates onto the floor. But, at the same time, I don't know what will happen. I don't know what to expect. I'm taking the wait and see approach, as should everyone else. No one should be making any assumptions about his coaching prowess. Great hiring, but we'll see how it goes.